Let me start with a disclaimer about myself. I am inexorably drawn to disaster movies, even the cheesy made-for-tv disaster movies. Especially the cheesy made-for-tv disaster movies. I am endlessly fascinated by various ways the environment can cause destruction across the globe, and even more fascinated by the potential for changing landscapes and coastlines. When I was a child there was a television special on various “prophecies” of how our world would change and that Denver would be a coastal port city. There was a map on the screen showing just what America would look like. I was hooked on the concept. Hypothetical disaster is *cool*. That personal history absolutely colors how I read a novel like Stephen Baxter’s Flood and what it triggers in my mind. Flood is a novel centering on that hypothetical disaster which I so adore in fiction. Rather than working as a print version of a disaster flick with buildings crashing down under the force of huge tidal waves, Flood is a thoughtful examination of a future in which the sea levels rise beyond all current predictive models. 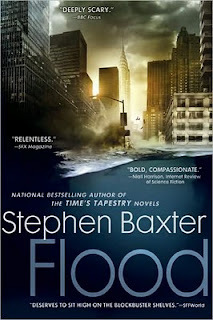 The novel takes place over thirty-six years, allowing for Baxter to demonstrate both the human cost of such a global flood as well as capacity for human adaptation to seemingly impossible situations. The first Section of the novel begins in 2016 with a note “Mean sea level rise of 2010 datum: 1-5 m.” As time passes, that simple note shows the inexorable rise of the sea, and through Baxter’s prose, the reader learns what that means for the world. The pacing and tonal content of Flood is nothing like that of a disaster movie, but that same itch of curiosity of how high the water levels will rise and what the shape of the world will look like is still there for me. While I no longer want most of the novels I read to include maps or graphs, there is a part of me that really wishes that Baxter had included an appendix with maps showing the drastic changes the titular flood caused. It is a petty want that stems entirely from that childhood fascination with global destruction, the kind that doesn’t think too deeply about what is happening to real people. Flood is concerned with real people. Though the protagonists of the novel are the fortunate elite who are connected to those with both means and money, Stephen Baxter is very concerned with the human cost of the global catastrophe. The novel opens with the rescue of four hostages: Lily, Helen, Piers, and Gary. They were taken five years prior and were passed from terrorist organization to terrorist organization. They knew nothing of the increased sea level and the beginnings of the global flood that had occurred between 2011 and 2016. Stephen Baxter tells the story through the eyes of these characters, most often Lily. The hostages are rescued by AxisCorp and are somewhat adopted by Nathan Lammockson because they know how to endure a crisis. Lammockson is an extraordinarily wealthy man, one who intends to make money in any circumstance. He is always looking to the future and preparing for the possibility the rise of the sea level will not cease. Given that this is a novel titled Flood and the jacket copy suggests that land will become scarce, it is not difficult to realize that Nathan is preparing for a flooded future that is already arriving. What this does is to put the protagonists of Flood into a position where they can observe and participate in the human exodus from low ground to high, but to do so in such a way that they are as protected as possible. Where the “average” civilian would either be a refugee or dead at various stages of this novel, the protagonists have this special status that may not entirely be realistic but allows for the reader to follow particular characters over the course of decades. There is a sense that these characters (Lily, most notably) are swept along by circumstances, rather than being players in their own destiny, but the viewpoints presented gives scope to the novel. Flood is a conceptually thrilling novel. Stephen Baxter does very well in writing about human characters and the physical and emotional displacement they undergo. A blurb for on the front cover of the hardcover from Niall Harrison calls the novel “bold, compassionate”, and that didn’t make much sense. How can a novel about such an extreme catastrophe be “compassionate”? By its very nature, the flood is anything but compassionate. The novel is, though. It treats the human characters with respect and shows a variety of viewpoints and circumstances across the globe. Baxter shows various means of coping and survival and the knowledge of what is occurring is nothing short of horrific. Though the central premise of the novel is horrific, the relentless rise of the water and reader’s imagination of what that might look like takes a novel focused on people and provides a sense of the thrill of the disaster movie. Yes, Flood frequently consists of people standing around talking, and much of the “action” takes place off the page and between chapters and years, but the tension-laden thrill is still there. The flood is also a character. This is not to say that the water has personality, but rather that just as much as any of the human characters and the human viewpoints, the flood is so large and so important that the setting comes across as character. Of course it is central to the novel, but the water is more than setting. Flood is a fantastic novel. There are no blockbuster set-pieces of water rushing into New York City and knocking down the Statue of Liberty, but Flood is stronger for taking the long-view of the global catastrophe. While Stephen Baxter may have made have given his characters some convenient opportunities to be connected to the powerful and thus have access to the science, the novel as a whole is well reasoned, horrifying, and exciting all at the same time. Various collapses and thrusts for power are given appropriate attention and Baxter doesn’t flinch from the human cost, even if the characters look from a distance of privilege. Flood is moving, exciting, and compels the reader to keep on through just one more chapter – until the book is done and the reader is hungry for the sequel, Ark. I'm a fan of disaster movies as well. This book sounds like a deep and realistic view of what would really happen. Sounds like this book could also be a hit with the green crowd as well as speculative fiction fans. It does indeed sound interesting. Given the content, I'm not entirely sure that the green crowd will dig it because of "global warming" because the book isn't exactly that and I don't think it inherently supports that hypothesis. On the other hand, the book is just fantastic - though it isn't a blockbuster disaster flick. The big stuff happens off the page. I read Flood and the sequel ARK last year. Both are awesome books. From my point of view Flood is no book for the green crowd. I agree with Joe that the big stuff happens off the page. Maybe you like to read my review of Flood . You will discover some similarities. "You want to feel the creeping dread of a doomed humanity tingling up your spine? You want to know what it feels like to run out of hope? You want to see how devastating water can be? You want to know how people react and change when they loose, in quick succession, their home, town, county, continent, and planet? You want to know the value of money on a dying earth? Do you really want to see what can happen in just 36 years? Then take a deep breath and read Flood."